Larry Klaes’ article on the film Silent Running, with its images of Saturn originally intended for 2001: A Space Odyssey, makes today’s story the obvious segue, and thus gives me the chance to catch up with some work I‘ve been wanting to write about. For scientists using Cassini data have been able to zero in on the age of Saturn’s rings, an always lively area of controversy, with evidence that the rings formed between 10 million and 100 million years ago. The new analysis is discussed in the journal Science. How to make such a call? Everything depends on getting a firmer fix on the mass of the rings, which in turn would tell us something about how bright individual ring particles must be. The brightness of the rings should have been affected by soot-like darkening inevitable over time. Fortunately, we had Cassini at Saturn to perform its so-called Grand Finale orbits, 22 dives between the planet and the rings. The gravitational effect of the rings went from being noise in data about the planet’s interior to a measurable quantity about both rings and host world. Think of Cassini in these orbits as a gravity probe, relaying data on its velocity and acceleration during its passage through Saturn’s gravity field. With acceleration pegged down to a fraction of a millimeter per second, the mass of the planet and its rings could be calculated. Even as we learn that the rings could be as young as 10 million years old, we also find that Saturn’s core has a mass in the range of 15 to 18 times that of Earth. Moreover, vibrations from within Saturn, still unexplained, warp the rings to create a pattern something like the spiral arms of a galaxy. Iess’ work is actually part of a two-planet project using radio signals from both Cassini and Juno at Jupiter to probe gravitational variations inside the giant planets. The scientist was behind the creation of a radio instrument for Cassini that worked in the Ka band, where signals are largely unhampered by interference from interplanetary plasma. The intent was, among other things, to test general relativity during Cassini’s journey to Saturn. 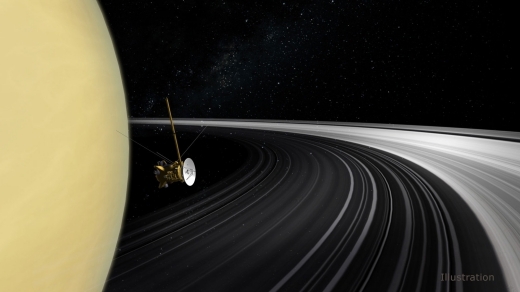 For most of the Cassini mission at Saturn, measuring tiny Doppler shifts in radio signals to study Saturn’s interior was problematic because of the rings, which is why the Grand Finale orbits have been such a game-changer. While Jupiter is often thought of as the benchmark giant planet for this class of astrophysical object, now known to be abundant in the universe, Saturn provides an interesting point of comparison and departure for understanding giant planet structure and evolution… For instance, Jupiter models are highly sensitive to the equation of state (EOS, the relation between important quantities such as temperature, pressure and density) of hydrogen, the most abundant element in the universe, and thus can help to probe the phase space region around a few megabars and ten thousand Kelvin, for which accurate lab experimental data are not available yet. Saturn, on the other hand, with 30% of Jupiter’s mass, probes less of hydrogen’s phase space but has its own host of complex issues. With its peculiar magnetic field and high intrinsic luminosity, Saturn provides challenges to our understanding of the first-order properties that define a gas giant planet. For both planets, an understanding of their bulk composition can come from interior modeling, which is an important constraint on formation scenarios. Radio fluctuations have been the key for mapping the gravity field at both Saturn and Jupiter, helping scientists learn about the deep interior. Comparing data for the two (the Jupiter data were released last year), the researchers found that while Jupiter’s core has an indeterminate boundary, Saturn’s core has a higher concentration of heavy elements, tentatively suggesting a better demarcated boundary. A key question: Does this have implications for the formation history of the two worlds? Scientists once believed the gas giants formed much like Earth, building up a rocky core before vacuuming gas from the protoplanetary disc. Such a stately process would have likely led to distinct layers, including a discrete core enriched in heavier elements. But Juno’s measurements, interpreted through models, suggested Jupiter’s core has only a fuzzy boundary, its heavy elements tapering off for up to half its radius. This suggests that rather than forming a rocky core and then adding gas, Jupiter might have taken shape from vaporized rock and gas right from the start, says Nadine Nettelmann, a planetary scientist at the University of Rostock in Germany. Interesting! And so are the differences between Saturn and Jupiter. Saturn’s equatorial atmosphere rotates around the planet faster than its inner layers and core. Only deep within the atmosphere do the layers rotate together, a trait Saturn shares with Jupiter. But the Cassini findings show that Saturn’s layers begin rotating in synchrony much deeper into the planet, as much as 9,000 kilometers down, or three times deeper than the same phenomenon at Jupiter. Even with the new work, we know all too little of Saturn’s deep interior, but so-called ‘ring seismology’ — using effects visible on the rings to draw conclusions about the atmosphere — is for the moment the best tool we have, at least until we get another spacecraft on the scene. As for the rings themselves, they’re losing material to Saturn, an indication of their relative transience. The rings may not have been in existence when the dinosaurs died. Will they be there at all in another 10 million years? Paul Voosen’s article is “Missions expose surprising differences in the interiors of Saturn and Jupiter,” Science 17 January 2019 (full text). For the work on Jupiter, see Iess, et al., “Measurement of Jupiter’s Asymmetric Gravity Field,” Nature 555 (07 March 2018), 220-222 (abstract); and Guillot et al., “A Suppression of Differential Rotation in Jupiter’s Deep Interior,” Nature 555 (07 March 2018), 227-230 (abstract). So now that we think we have resolved the age issue of the rings, we need to investigate what was the cause and what is their future.Are there models of collisions that allow such rings to form? Are the rings stable or will they eventually be swept up or otherwise disappear? And why does Saturn have such large and bright rings while all the other Jovian planets in our Sol system have such thin and dark ones? What did they do (or not do) that Saturn did not do (or did do)? And are rings common to Jovian type worlds everywhere? What happened at Saturn was the breakup of a large moon due to tidal pull and/or collision. Rings are bright if they are young and dark if they are old. It used to be (still is?) that rings form from bodies or material inside the Roche Limit. This implies to me that we should expect rings when moons form around large planets, or captured bodies orbit inside this radius. As our telescopes get better, perhaps we will soon have more examples of exoplanets with large, spectacular ring systems to inform our ideas. Thinking about this now, I can give a possible explanation based on how stars and double stars form. They form from collapsing clouds of gas which collapse towards a center before the flat accretion disk is formed so a gas giant might form the same way like a Star. It makes sense since the idea that a gas giant can form only behind the snow line in an Earth sized exoplanet and cold surface with only the little sunlight of the outer solar system, so the hydrogen does not escape does not explain how gas giant exoplanets that are assumed to have formed in situ near their stars since their environment is hot. Migration has to be assumed if gas giants have to form behind the snow line, but they can’t form with an Earth sized protoplanet first and then become a gas giant near a star which does not make sense scientifically. I never thought about challenging that idea and accepted it uncritically until I read the Centauri Dreams article. I take it that you mean that gas giants can form interior to the primary’s snow line via massive gas cloud collapse. That really MUST be the case, since that’s how stars form and and a great many close binary stars are found in which the gas feeding both protostars would be heated by gravitational collapse. Hot gas can resist collapse only to a point, so as long as there is a sufficent (massive enough) core a massive planet would be able to form in place just like stars do. @Geoffrey & Bruce. Does this mean that the model of Jupiters wandering in from outside the snow line is not needed, or is this just another mechanism? What about hot Neptunes? Planetary migration surely happens, and apparently quite commonly during the early phases of a planetary system’s formation. For example our system shows evidence of such involving particularly Jupiter and Saturn, leading to the Late Heavy Bombardment. It seems apparent to me that both formation in place due to massive gas cloud collapse AND migration occur. How much angular momentum any given collapsing gas and dust cloud possesses at the start of its collapse will have a great deal to do with where the planets will end up and their masses. Systems with much angular momentum (like ours) will be more likely to end up with distant gas and/or ice giant planets, while systems formed from a cloud with little spin would be much more compact, I would think. It’s incredible what astrophysicists and scientists can learn about a gas giants interior composition from changes in radio wave frequency or Doppler shifts caused by a gas giants gravity like Saturn.